CJ Greaves Ends Rookie Season on High Note with a Podium, Top Three in Points for the Year! Temecula, CA (December 15, 2010 )—CJ Greaves winding down his stellar rookie season with a trip to Firebird International Raceway in the Phoenix suburb of Chandler, AZ this past weekend in the Lucas series Super Lite class for the final races of the season. Five drivers entered the weekend still in the hunt for the championship. CJ was sitting in third place with only 25 points separating him from first place. After qualifying third on Friday, CJ was looking very competitive for round 15 racing on Saturday. When the green flag flew, he wasted no time powering his #33 Traxxas/ Monster Energy/ Oakley/ FoxShox/ BFGoodrich sponsored truck to the lead on the first lap. He held the top spot the entire first half of the race leading up to the competition caution and looking very strong. Kargola, LeDuc, Kirchner, and George finished out the top five. Kyle LeDuc was able to pass CJ a few laps into the second half of the race. He was holding tight to the second spot when bad luck struck. CJ’s motor stalled and he was unable to re-fire it as the entire field passed him with only 2 laps to go. In spite of the disappointing finish on Saturday, he was able to finish out the season with an impressive third place in the standings. Round 15 was not the only race of the weekend for CJ. He headed back to the grid once again on Sunday for the all-or-nothing season finale Challenge Cup Race with a $20,000 purse on the line as extra incentive. CJ picked up where he left off on Saturday before the bad luck struck. He worked his way into the top three where he battled throughout the race. With nothing to loose and a nice paycheck to gain, the racers were wild and reckless! A big pileup between Jacob Person, Brandon Ward, and Jeff Kargola in turn three resulted in a full course caution early in the race. Kargola was able to continue, but Ward was not. The carnage continued throughout the race. CJ was sitting in second place as the yellow flag flew for the competition caution. Kyle LeDuc continued to lead leaving Chad George and CJ to duke it out for second. George would eventually pass Greaves’ #33 truck. LeDuc was able to hold off George and a surging Greaves to take the win. CJ Greaves would round out the podium in third, bringing home a nice Christmas bonus check for $4000! Be sure to follow Johnny and CJ Greaves as they prepare for the 2011 Season. Greaves Motorsports will once again field a Pro-4 and Pro-2 truck as well as the Super Buggy. They will add a Pro Light Truck to the mix. See all the latest developments at JohnnyGreaves.com. Las Vegas, NV (November 9, 2010)—CJ Greaves headed to Las Vegas to compete in the Super Lite Class this past weekend. As the season winds down, CJ sits third in the points and a strong contender for the championship. At this point though, every race is a make or break situation. Saturday, CJ struggled early. But he continued to battle hard and did not give up and made a last lap charge for a podium spot. With a lot of mayhem taking place in front of him, CJ was able to put his Traxxas/ Monster Energy/ Oakley/ FoxShox/ BFGoodrich machine back into the mix with a top five finish just behind Jeremy Stenberg who is 2nd in points. Saturday’s race was filled with a lot of rolls and crashes—something you would expect in a close points battle. CJ started in the 8th position but struggled with problems early in the race. Following the competition caution, points leader, Chad George, pulled-up lame with a broken suspension. The race also heated up for the top 5 positions. Stenberg and Person got together battling for third causing them to spin-out in the middle of a jump. Another truck crashed into Person. The mayhem brought out the red flag so that race officials could clear the track. All of the action in front of CJ allowed him to make up some ground. At the restart he was able to work his way into the top five by race end. Anxious to redeem himself, CJ would start on the front row in Sunday’s race due to an inversion. When the green flag flew, new points leader, Twitch Stenberg grabbed the early lead with CJ running in 2nd and RJ Anderson in 3rd. Kyle LeDuc, sitting in for the injured Ricky James, was in 4th but managed to move into 2nd before the competition caution. CJ would drop back to 4th where he remained until the white flag flew. Kyle LeDuc rolled his machine in turn 2 allowing everyone to move up a position. Stenberg took the win, but CJ rounded out the podium in third to remain in the championship hunt with only one round of racing remaining. The Super Lite class will come to an exciting head next month as the series heads to a showdown at Firebird Raceway in Phoenix, AZ, on December 11th. Surprise, AZ (Sept 29, 2010)—CJ Greaves, fresh off of his Traxxas TORC Series Super Buggy Championship, turned his focus on the Super Lite truck class in the Lucas Series this past weekend at Speedworld Off Road Park in Surprise, Arizona. CJ entered the weekend with his Traxxas/ Monster Energy/ Oakley/ FoxShox/ BFGoodrich machine sitting in the number two points spot. He would leave remaining in the top five with just a few points separating first to fifth place. Saturday, CJ was looking good in the early going of the race. He made quick work of the field and was sitting in the third spot at the competition caution. With the field consisting of various levels of talent and experience, it makes for some very unpredictable racing. When the green flag fell for the restart, Twitch Stenberg got into CJ, eventually spinning him out and Tanner Foust finished him off a turn later, giving him a flat tire. Black flags were issued but the damage had already been done taking CJ out of contention. CJ would regroup for Sunday’s race but he would have his work cut out for him as he would have his number 33 starting from the back of the field of 13 Super Lite trucks. When the green flag feel, he began to patiently work his way through the field and made his way up to fifth just ahead of the mid-race caution. Person and Ward, who were running third and fourth at the time, got together on the restart in turn five. CJ took advantage and charged up to the third position. With the white flag waving, it was Stenberg, Anderson, Greaves, Clark, and George in the top five. As the top five worked hard to take one more position before the checkered, Anderson made a mistake, opening the door for Greaves to move up into second place just before the start/finish line to bring home his 6th podium of the Super Lite season. The LOORRS will take the month of October off and reconvene at Las Vegas Motor Speedway on November 6-7th. Crandon, WI (September 6, 2010)—The Monster Energy/ Toyota/ BFGoodrich/ MasterCraft Safety team of Johnny Greaves, Jeremy McGrath and CJ Greaves headed to Crandon International Raceway this past Labor Day weekend for the season finale of the Taxxas TORC Series with championships on the line: Johnny in the Pro 4×4 and CJ in the Super Buggy Class. Jeremy McGrath was a long shot for the Pro 2WD championship but was sitting third in the points standings and looking to finish out the season with an impressive top three position. 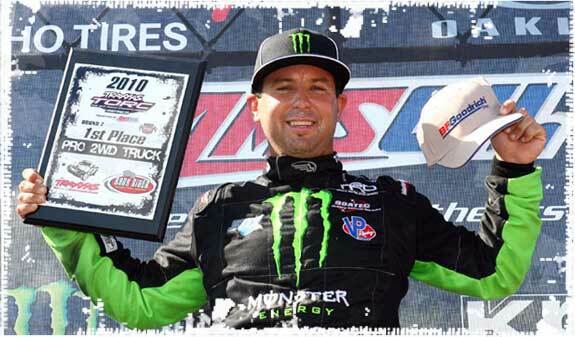 When the final checkered flag fell, Johnny had earned his ninth professional championship by taking the 2010 Pro 4×4 class title with 5 wins and 8 podiums this season. The battle was very tight though, with fellow Monster Energy/ Toyota/ BFGoodrich teammate Rick Huseman finishing only a few points behind Johnny in the runner-up spot. Johnny also came in third in the newly dubbed AMSOIL Cup (formerly the BorgWarner Cup) Sunday afternoon in the final race of the season. Johnny accepted his championship in front of his many friends, family and a host of Johnny Greaves fans that were part of the more than 15,000 that showed up for their annual pilgrimage to Crandon. As if winning a championship were not enough, Johnny would also have the pleasure of seeing his 15 year old son, CJ, win the Super Buggy championship in only his first season as a racer. 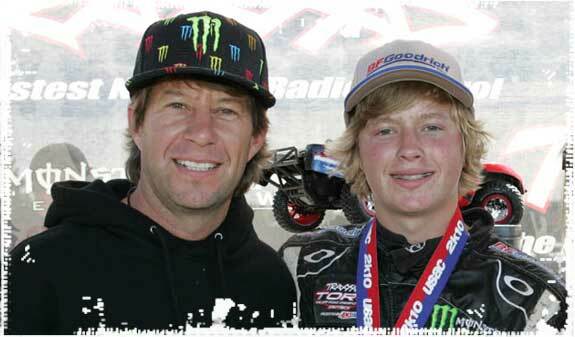 CJ is the youngest driver to win a championship in a full-size short-course vehicle as well as the first father/son combination championships. CJ made a clean sweep of the races in Crandon by taking his Traxxas/ BFGoodrich/ Oakley Super Buggy to the winner’s circle in both races in dominating fashion. CJ will continue to compete in the Lucas series’ SuperLite truck class where he sits second in the standings by only 10 points. The next race takes place in Surprise, AZ, later this month. Jeremy McGrath landed on the podium on Saturday to solidify his top 3 position for the season behind last years’ champ Rob MacCachren, who lost the championship to Ricky Johnson by a narrow margin. This class had all the top drivers running neck-and-neck all season long. To finish ahead of the likes of Scott Taylor, Chad Hord, Jeff Kincaid, and others, is no small task. 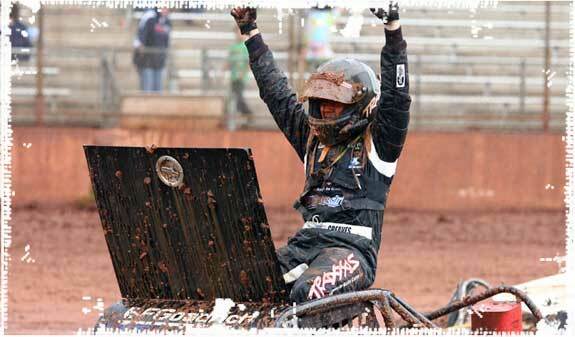 Jeremy had seven top five finishes this season along with his first off-road victory at Bark River. He also had 2 Oakley Bomb awards to his credit. The unpredictable Midwest weather brought rain and cool temperatures to the region on Friday and into the early morning hours of Saturday. Practice and qualifying were canceled to save the track. As soon as the rain left the crews started working on the track which, along with the weather, turned out great for Saturday’s racing action. 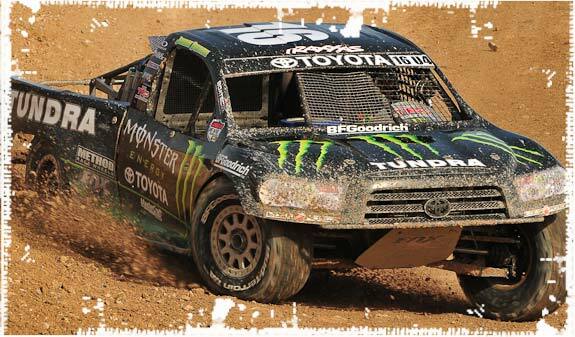 After drawing straws for position, Johnny lined his Monster Energy Toyota with BFGoodrich tires up in the 6th position for the famous “land rush” start. As the field of 10 trucks, the largest of the season, headed to the turn-one holeshot, avoiding a crash was the first priority. Johnny made it through clean just behind Steve Barlow. He quickly passed Barlow however to take the lead and held it firm leading up to the competition caution. The second half of the race was filled with flips, rolls and fires, all behind the front running Johnny Greaves. Johnny got a great jump on the restart and pulled away with Barlow, Douglas, Huseman and Cenni in tow. As the laps clicked away, the white flag seemingly flew to signal “let the carnage begin!” Jenkins and Barlow both rolled hard and Scott Douglas, who was running in second at the time, caught fire and had to pull out of the race. Huseman finished second putting the familiar Monster Energy/ Toyota/ BFG duo of Greaves and Huseman side-by-side on the podium once again. Johnny would head into the Sunday championship round carrying a small cushion over Huseman. 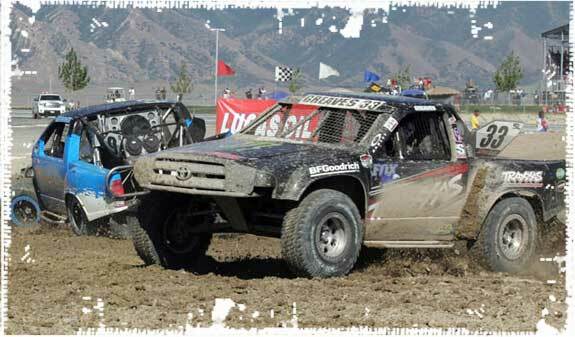 Jeremey McGrath took on the field of Pro 2WD racers that included NASCAR’s Robby Gordon for the second year in a row. He started 5th on the grid and made it through turn one unscathed. He maintained his top five spot leading up to the competition behind Kincaid, Rob Mac, and Ricky Johnson. With a field of 11 hungry drives hitting turn-one at the same time, a lot of heavy contact shuffled Jeremy back a few positions. Jeremy battled back though, charging hard to take back one spot at a time. Kincaid eventually dropped out of the race with mechanical problems and Jeremy would make his way up to the third spot where he finished, to round out the top three for his fifth podium of the year. As the tension mounted for Sunday’s showdown, Johnny was cool, calm and focused, knowing that the team had configured a great truck for the finale. The BFGoodrich tires had performed outstanding on Saturday and the Toyota/TRD power plant was flawless. His FoxShox also played an important role since the winding 1.5 mile fabled track features many challenges and is very demanding for suspension systems. The Pro 4×4 race on Sunday turned out to not be as calamity riddled as Sunday’s, but saw Johnny clinch his championship with a second place finish behind Rick Huseman. Johnny took the lead early. As the race progressed, Johnny was playing the smart points game and compiled the necessary points to clinch at the competition caution. Rick Husman battled with Greave and eventually took the lead in the gravel pit turn. Johnny stayed on his tail and made one final dash for the lead but ended second in a very close nose-to-tail finish at the checkered flag. Jeremy McGrath started Sunday’s action in the 5th spot in a race that was filled with trucks bumping and grinding and involved McGrath’s number 2 Toyota in multiple crashes. Robby Gordon couldn’t make the turn as the track hairpins just in front of the start/finish line. He veered across the track causing several trucks to get together and the havoc rendered several with severe damage, including McGrath’s machine. But, Jeremy was able to continue and worked his way back up to the sixth place leading up to the competition caution. On the restart, Chad Hord was racing hard for the holeshot and got into Jeremy. With a number of components broken, including power steering, Jeremy was force to exit the race. 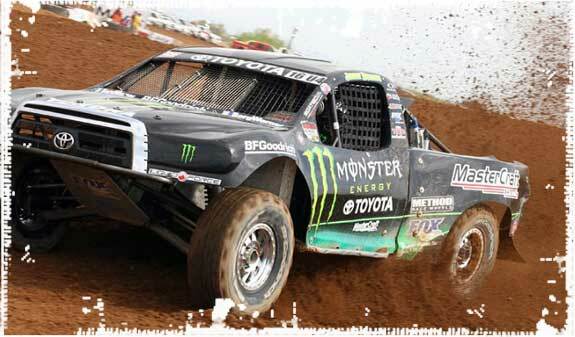 The damage was so severe that it also knocked his truck out of the AMSOIL Cup race. In the Super Buggy race, one of the drivers jumped the green flag and through CJ Greaves off on his start. CJ was patient through turn one however and before the end of lap one had his Traxxas/ BFG/ Oakley machine in the lead. He finished the race in front to complete the weekend sweep, take his 10th podium in the 12 rounds of racing, and claim the points championship. As an added bonus, the final race of the season was the AMSOIL Cup—AMSOIL taking over sponsorship of the BorgWarner Cup that pits the Pro 4×4’s against the Pro 2WD competing for a $25,000 prize. The two-wheel drive trucks got a 12 second jump of the 4×4’s. With 20 trucks on the track at one time, it seems almost impossible, but the Pro 4’s overtook the Pro 2’s with several laps remaining. Equally as impossible, and in typical Johnny Greaves form, Johnny made a great comeback in the race. He got together with Curt LeDuc early sending him all the way back to 14th. He began to carve his way back through the field though, working his way to the front and catching the top two leaders with 2 laps to go. In the finish line corner, the second place running Steve Barlow made a last ditch attempt to get around leader Scott Douglas taking the outside line. In the process he inadvertently pushed Johnny into the wall leaving them each with a small gap, and finishing in that same order: Douglas, Barlow and Johnny rounding out the podium with the third place finish. 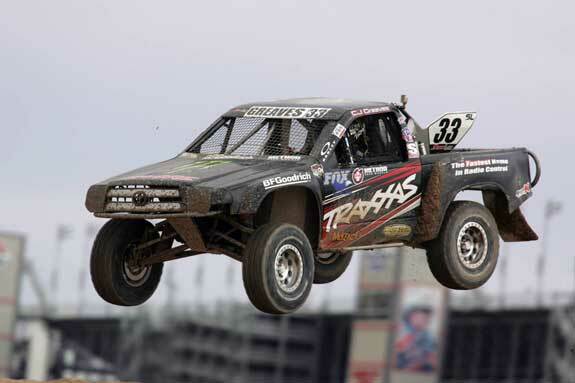 Johnny Greaves Motorsports finished the 2010 Traxxas TORC Series with amazing success. Fans can now watch the season unfold on the Discovery Channel’s HD Theater every Thursday evening at 8pm Eastern and Pacific times. We would like to thank all of our great sponsors for your continued support. Jeremy, CJ and I could not have been successful on the track without you. 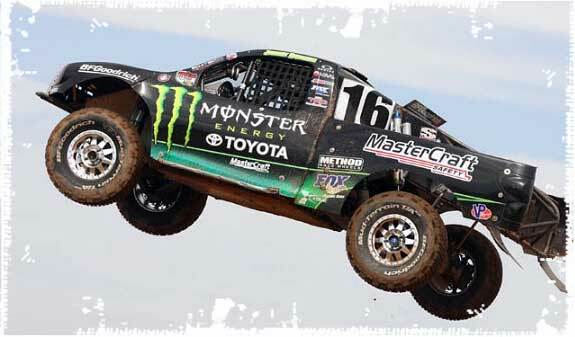 Monster Energy, as our title sponsor, along with Toyota/TRD, BFGoodrich and MasterCraft Safety, FoxShox, Oakley, Method Race Wheels, AMSOIL, VP Racing Fuels, Boatec Racing Bodies, Liquid Force, Kawasaki, and Traxxas. Joliet, IL (August 26, 2010)—The Traxxas TORC Series converged on Route 66 Raceway located adjacent to Chicagoland Speedway in Joliet, IL, for rare mid-week races. USAC scheduled the Rt 66 race in an effort to hitchhike on NASCAR’s Camping World Truck Series race that would take place on Friday night at Chicagoland Speedway. The racing complex features Chicagoland Speedway, a drag strip, and the dirt track—all nestled in thousands of acres of corn fields. As the season winds down, rounds 9 and 10 would present another defining moment in the very tight points race for the Monster Energy/ Toyota/ BFG/ MasterCraft team of Johnny Greaves. With only 2 points separating 1st and 2nd place, and 7 points to the 3rd place position, the stage is set for an exciting season finale in the upcoming Labor Day weekend races at Crandon International Raceway. Johnny had a tough night on Wednesday, but would rebound for an exciting win on Thursday. Jeremy McGrath took two fifth place finishes from a very close and competitive field. This weeks races saw the additions of two other veteran Pro 2 drivers including Todd LeDuc and Kevin Probst. Also, making a cameo appearance in the Traxxas TORC Series was NASCAR’s Kyle Busch, making his off-road debut in the Pro 2WD class. As if the fierce fender banging action of TORC series short-course racing, Kyle Busch’s appearance, and the entire Chicagoland experience weren’t enough, 7-time Supercross Champion, Jeremy McGrath was inducted into the Motorsports Hall of Fame on Thursday evening. Jeremy accepted his induction live via remote webcast using USAC’s streaming capabilities while standing just outside of the Greaves Motorsports pit area among a bevy of cameras and reporters. In a last minute decision, USAC allowed the Super Buggies to race in an exhibition before the pro drivers hit the track each night. CJ Greaves continues to make his presence known in his rookie year by winning both races in dominating form. Johnny Greaves pulled the fastest time in qualifying, giving him the coveted pole position. The FoxShox shocks and BFG tires were getting a workout. The knarley and technical track had a rhythm section that was brutal. The converted oval track had a couple of whoops at the entrance to the infield section of the track that cost a number of drivers their race. The tabletop sent the trucks hurling 125 feet through the air. When the green flag flew, Johnny powered ahead to take the lead early. By lap 2, fellow Monster Energy/ Toyota/ BFG driver, Rick Huseman, battled all the way from the back to set up the familiar nose-to-tail battle between the two. Huseman managed to take the lead in lap 4, but Johnny was able to battle back to retake it before the competition caution. Johnny, realizing he had a bent wheel, wisely decided to take advantage of the caution and relinquished his lead to change the tire. He hit the hot pits for a quick tire change. Johnny rejoined the field at the rear before the green flag flew. Due to some track confusion, Johnny picked up the field at the exit of the hot pit without going around the track. USAC officials issued him a Black Flag which effectively put him out of contention for the comeback and finished a disappointing 6th. Jeremy McGrath rolled off his Monster Energy Toyota from row 4 in the very competitive Pro 2WD class for the final race of the evening. Once the field established its racing order on the track, there were very few changes with Jeremy’s number 2 settling into the sixth position. Ricky Johnson and Rob MacCachren battled up front until the last lap. MacCachren suffered some type of mechanical problem allowing everyone to move up a position and putting Jeremy in the 5th place. Earlier in the evening, the Super Buggies had an exhibition race. CJ Greaves earned the pole position with a time almost a full second faster than the next competitor. When the green flag flew, CJ took the lead right away and never looked back, stretching his lead with each passing lap. He would take the win by a very comfortable margin. The incredible weather was refreshing as the teams prepared their racing machines for the evening’s races. Crew Chief, Curt Greaves and Chief Mechanic, Brad Marty along with the TRD technicians tweaked the two Toyotas and had them in top running condition. The full moon rose above the track symbolizing the calm before the storm, as the aggressive driving still loomed in the minds of everyone from the Bark River races. Johnny started from the pole position once again—this time due to the 6 car inversion in a field of 9 PRO 4X4 trucks. As the Traxxas Pace Truck pulled off the track, the roar of the 800 horsepower trucks hurled all nine trucks, nose to tail into turn one. Greaves got the holeshot but Curt LeDuc tried to stick the nose of his machine inside of Greaves but hit the barrier and rolled hard in a cloud of dust in the middle of turn one. On lap 3, Kyle LeDuc rolled bringing out a full-course caution. He was able to continue in the race and would get himself back into contention later in the race. As the restart ensued, points leader, Rick Huseman began to slow and eventually pulled off the track with a broken suspension due to early contact with Steve Barlow. Greaves led the rest of the race, fighting off a challenge by Scott Douglas. He ended the race by a comfortable margin, taking the win and the points lead by 2 points. Douglas squeezed out a second place finish after several near disastrous close calls, edging him closer to the points leaders and only 7 points out of first. With the tight points race, the 2010 championship will be determined in both races in Crandon on September 4th and 5th. Jeremy McGrath also found himself starting from the pole position in the Pro 2 race. McGrath got off to a great start and took the lead on the back stretch as the field emerged from the holeshot. He was able to hold the lead until lap 5. Ricky Johnson was charging through the field and eventually overtook Jeremy for the lead at the end of the whoop section. At the competition caution, Rob MacCachren got a run on the front runners and jumped all the way up to 3rd, shuffling Jeremy back to the 4th spot. Todd LeDuc also passed Jeremy who would end the race with his sixth top five of the season. Jeremy maintained his third place points position going into the final race weekend in Crandon. Earlier in the evening, Jeremy was honored by being inducted into the Motorsports Hall of Fame of America along with 7 other legends. While the black-tie gala was taking place in Detroit, MI, Jeremy appeared from the Route 66 Raceway via TORC/USAC’s live webcast. The 7-time Supercross Champion, also known as “King of Supercross” and “Showtime” has a list of motocross accomplishments a mile long. CJ swept the Super Buggy class with another convincing win on Thursday evening. Even though the races were not for points, he put on a great performance, giving him a lot of momentum and confidence going into the final rounds. He currently sits 1 point out of first place. Greaves Motorsports will make the quick turnaround and get ready for the races in Crandon, WI. Along with the close points races, the annual BorgWarner Shootout will be the highlight of the weekend and climax to an exciting season of Traxxas TORC Series racing. Replays of the Chicagoland races can be seen on JohnnyGreaves.com via TORC/ USAC’s USTREAM feed or by going to TORCseries.com. Jeremy McGrath would get his first off-road truck racing victory in the Saturday race and follow it up with a close second place on Sunday in the Pro 2WD class. He earned the Oakley Bomb Award for the fastest lap trying to chase down Jeff Kincaid in Sunday’s race. Johnny earned a hard fought Pro 4×4 second place finish on Saturday, only to be knocked out of the race on Sunday by an overly aggressive Scott Douglas. He would however bring home the Oakley Bomb Award in both rounds of racing. CJ Greaves, in his Traxxas sponsored Super Buggy, would also suffer some bad luck with a roll-over in turn one that put him out of contention in Saturday’s race and suffered a mechanical problem on Sunday. He would relinquish the points lead to Bob Klaus but only by one point and definitely still in the championship hunt. There was nothing to prove for Jeremy McGrath in off-road truck racing leading up to rounds 7 and 8 in Bark River having had multiple podiums and a ton of close calls—but no wins to his credit. The seven time motocross champion, X-Games medalist, and soon be to inducted in to the Motocross Hall of Famer is no stranger to victory. Jeremy was finally able to add the illusive first place finish to his list of accomplishments this past weekend as he ran a brilliant Pro 2WD race on Saturday to claim his first victory. Jeremy’s Monster Energy Toyota started in the pole position on the front row with points leading Rob MacCachren along side. Behind them were a pack of hungry drivers with the likes of Ricky Johnson and Chad Hord on the second row. Getting the all important holeshot is no easy task in Bark River, but McGrath was able to plow through to take the top spot. From there, he ran a flawless race, guided by spotter and crew chief, Kurt Greaves. The Pro 4×4 race was arguably the most exciting race of the weekend. The fans witnessed two of the best off-road racers battle from the green flag to the final lap, the final turn, and to the checkered flag. The two Monster Energy trucks of Johnny Greaves and Rick Huseman put on a show for the crowd in the final race on Saturday. Greaves and Huseman started on the front row for the two-by-two rolling start. The field of 7 powerful 4×4’s stormed towards the horseshoe shaped turn one, going almost 3 wide in a cloud of dust and debris. When the dust settled, it was the BFG clad Toyotas of Huseman on point and Johnny Greaves right on his bumper. That is the way they would run leading up to the competition caution setting up an epic battle for the second half of the race. Huseman would win the holeshot but with Johnny and Scott Douglas nose to tail going into the front stretch right behind him. Johnny and Rick eventually pulled away from the rest of the field and proceeded to do battle through each turn for the remainder of the race—sometimes going side-by-side. Each time Huseman would hold off Johnny’s attacks until lap 8. Johnny grabbed an opportunity going through the table-top and made the pass for the lead, only to loose it again in the long sweeping horseshoe turn of turn one. That is the way the race would end with Johnny taking a hard fought second. Johnny would earn his 5th Oakley Bomb Award during the race for the fastest lap. CJ Greaves Super Buggy race was short lived. He started the race in the ninth position and chose the outside line heading towards the turn one holeshot. That turned out to be a case of being in the wrong place at the wrong time. One of the other competitors spun, collecting CJ in the process, knocking him on his side and out of contention for the race. 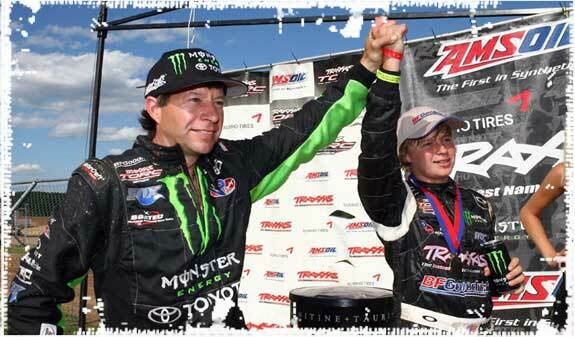 In the Sunday race, everybody wondered how Jeremy McGrath would follow-up his victory on Saturday. Jeremy started on row three which would make it more difficult to win the holeshot. Jeremy made it through the mayhem cleanly though, winding up in fourth behind Kincaid, Taylor, and MacCachren. Rob Mac would swing wide off the track in Cemetery Corner advancing the number 2 Monster Energy Toyota of McGrath to third. As the field shuffled positions around, eventually Jeremy would battle with veteran Scott Taylor for the second spot. Taylor suffered a mechanical problem and had to pull out of the race leaving Jeremy to take sole possession of second behind Jeff Kincaid, who had pulled away to a sizeable lead. Jeremy and Kincaid held their positions through the restart following the competition caution. While the rest of the field diced it up behind them, the two leaders pulled away. McGrath, not wanting to settle for second, began to real in the machine of Jeff Kincaid. He stayed right on his bumper through the entire final lap, trying every thing he could to get around the very “wide” machine of Kincaid to no avail. Jeremy settled for second but pulled his fastest lap in his pursuit of Kincaid, earning him his second Oakley Bomb Award of the season. 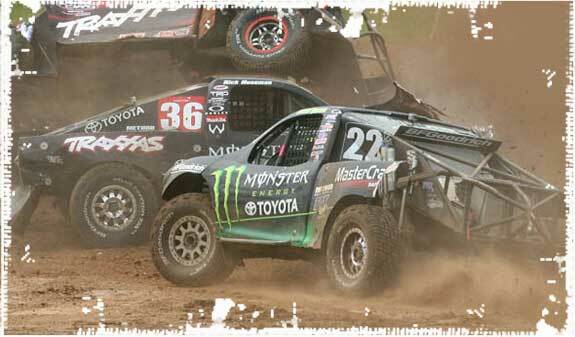 The Pro 4×4 race on Sunday featured some of the most aggressive driving of the season. Johnny Greaves started the race on row two beside Scott Douglas with Jenkins and Barlow occupying the front row. Saturday’s winner, Rick Huseman started in the back. Douglas, Greaves and Huseman ended up in the top three, two thirds of the way through lap one. At the AMSOIL sweeper on the back stretch, Douglas spun, nearly taking out all three of the leaders. Huseman was the beneficiary of the spin and was promoted to the lead. Johnny, who was tangled up with Douglas, held on to third behind Douglas as they were able to right their machines and get going once again. On lap 4, Greaves got a great run on Douglas down the hill heading into Cemetery Corner putting him in position to make the pass which he was ultimately able to do in the horseshoe turn at the start/finish line. The mandatory caution bunched the machines back together. Greaves, out of tear-offs and looking right into the roost of Huseman, was in the middle of the holeshot which had all the trucks banging and sending body parts flying everywhere. Scott Douglas was clearly taking his frustrations out on the field, crashing into Johnny and pushing Huseman off the track heading into the rhythm section in front of the screaming crowd. The damage was severe for Johnny, knocking him out of the race. Douglas would not finish on the podium however and Rick Huseman would hold on to take the win. Johnny had the fastest truck on the track as evident by earning his second Oakley Bomb award of the weekend for the fastest lap and his 6th of the year. The Super Buggy misery continued for CJ Greaves and make for a weekend that he would like to forget in his young racing career. Early in the race, CJ’s Traxxas/ Monster Energy/ BFG buggy suffered a mechanical problem that caused him to have to pull out of the race. He was able to return to the race, two laps down, and out of contention but saving valuable championship points. With only 4 rounds of racing left in the 2010 TORC season, Johnny and Jeremy will look to Chicagoland for their opportunity to put themselves in position for the championship weekend on Labor Day in Crandon. The Chicagoland races will be midweek races on August 25-26th with NASCAR’s Kyle Bush joining the field for his off-road debut. Replays of the Bark River races can be seen on JohnnyGreaves.com via TORC/ USAC’s USTREAM feed or by going to TORCseries.com. 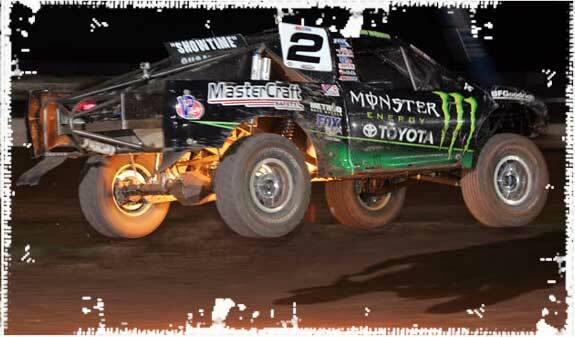 Super Lite ‘Super Kid’ CJ Greaves Goes 1 and 2 at LOORRS Glen Helen Race in Southern Cal. San Bernardino, CA (August 9, 2010)–CJ Greaves put aside his Traxxas TORC Series Super Buggy goggles and headed to Southern California’s fabled Glen Helen track for rounds 9 and 10 of the LOORRS Super Lite class this past weekend. CJ proved once again that winning is in his DNA, taking the top podium spot on Saturday evening and a close second on Sunday in his Traxxas/ Monster Energy/ Oakley/ FoxShox/ BFG decaled machine. The 256 acre Glen Helen Raceway complex played host to the Lucas Series on a newly constructed track built for off-road truck racing. The 0.8 mile track had tight turns but was wide enough to allow many passing opportunities. CJ took advantage the passing lanes by charging to the point position before the end of lap one in the Friday night race. CJ would hold the top spot through multiple full-course cautions from roll-overs behind him and a near catastrophic collision in front of him by lap traffic on the final lap. Fortunately, he had built a sizable lead, setting the fastest lap time in the process, and allowing him to get away from the ruckus without loosing his position and taking home his second win of the season. Saturday’s race would be another hard fought battle for CJ Greaves as he would go head-to-head with Metal Mulisha’s Jeremy Stenberg and Jeff Kargola in the closing laps. CJ was sitting in the third spot following the competition caution, but a crash in turn four shuffled things up pushing him back a position. CJ was able to battle back and recapture the third position and patiently settled in behind Stenberg and Kargola who were trading licks in front of him. As the final laps approached, CJ seized the chance to pass Kargola with a great outside move to take the second spot. However, he ran out of time with Stenberg taking the win just in front of him. With his outstanding performance this weekend, CJ Greaves moved into the third position in the points standings and just 32 points from the leaders (the top two are tied for first). CJ will head back to the Midwest and crawl into his Super Buggy once again this coming weekend, August 14-15th, at Bark River International Raceway in Bark River, MI. He will be defending his points lead in this class that is chalk-full of veterans. The races will be streamed live on the internet on TORCseries.com and USAC’s USTREAM portal. Oshkosh, WI (July 25, 2010)–Oshkosh, Wisconsin, known more for its excellent fishing, children’s cloths, and world renowned air show, added short-course off-road racing to its list of attractions this past weekend. A capacity crowd converged on the Oshkosh Speedzone Raceway for rounds 5 and 6 of the Traxxas TORC Series to see the Monster Energy/ Toyota/ BFG/ MasterCraft Safety trio of Johnny Greaves, Jeremy McGrath and CJ Greaves take on some of the top professional drivers in the country in their respective classes. Johnny, Jeremy, and CJ went to the Speedzone Raceway carrying a lot of momentum from the previous race in Bark River, MI: Greaves as the new points leader and Jeremy proving he had what it takes to run up front and make it stick, and CJ Greaves also grabbing multiple podiums. The Oshkosh track featured a different type of race course than the previous races, adding more of a stadium feel, which included stock car turns, long front and back stretches, and tight 180 degree infield turns and rhythm sections. Both rounds of racing were under the lights which added another challenging element to the competition. Greaves, McGrath and CJ would all add podiums to their records putting Monster Energy/ Toyota/ BFG/ MasterCraft Safety in the spotlight once again for the television broadcast that will premier in High Definition on September 2nd. Jeremy came from the back of the star studded field of PRO 2WD drivers on Friday night to take his first second place spot of the season while Johnny Greaves would also cruise to a second place finish in the PRO 4×4 class. CJ Greaves battled back from a lap one spin to capture a third place finish in his Traxxas/ BFGoodrich/ Oakley/ Super Buggy. Jeremy also took home the Bosch Power Pass Award for the move he made on Rob MacCachren in the infield hairpin turn. On Saturday, Jeremy McGrath made it a two podium weekend by landing his number 2 Toyota in the third spot, propelling him all the way from eighth in the points to third. Johnny put on an impressive show for the fans too and it looked as if he would take another win. But, a mechanical problem forced him to limp around the track for the final few laps. He didn’t get the win but was able to finish the race, saving valuable points, and walking away from the weekend stretching his points lead. Even though he suffered mechanical problems, Johnny received his fourth Oakley Bomb Award on Saturday night for his fast lap time, his second of the weekend! The Bark River, MI, race will be held on August 14-15th. Replays of the Oshkosh racing action can be seen on the series website: TORCseries.com. Abrams, WI (July 12, 2010)–Greaves Motorsports headed to the Upper Peninsula of Michigan to their “home track” at Bark River, Michigan for the Traxxas TORC Series’ rounds 3 and 4 this past weekend. The rural track, that snakes its way around hills, a gravel pit and even a cemetery, is the fastest track on the circuit. This “drivers’ track” features the biggest jump–rightfully dubbed “Monster Energy Jump” where the 800 hp trucks get some sick air of nearly 200 ft! Johnny Greaves and his Monster Energy/ Toyota/ MasterCraft with BFGoodrich tires dominated the Pro 4×4 class taking wins in both races and in the process earning two Oakley Bomb Awards for the fastest lap times. Jeremy McGrath suffered bad luck with mechanical problems in both races but showed a lot of power and prowess as he ran up front in most of the two weekend races. He earned the Oakley Bomb, fastest lap time award in the Saturday race–a race that had him running blind with a broken hood in his face much of the race! CJ Greaves had outstanding races in his Monster Energy/ Traxxas/ BFG Super Buggy and walked away from the weekend’s races still leading in the points standings. Jeremy McGrath started his Monster Energy/ MasterCraft/ Toyota/ BFG on the third row for the rolling start in front of a crowd of 5,000 of the most rabid off-road racing fans on Saturday’s opening round of racing in Bark River, MI. Mike Oberg got the hole shot but Jeremy was able to land in the fifth spot through lap 1. By lap 3, Rob MacCachren started loosing air in a tire due to some early contact and had to pull into the hot pit for a tire change. Jeremy passed Chad Hord and moved into second. Part of Jeremy’s hood broke loose and causing him to drive blind leading up to the competition caution. At the restart… lots of dust! Kincaid moved around Hord for third and set his sites on Jeremy, who was driving blind in several turns. On lap 7, Oberg went wide on the front stretch and “Showtime” McGrath made a strong move to his inside to make the pass for the lead. Jeremy made it around the track in the lead, but just before the start finish line, with two laps to go, he pulled off the track with mechanical problems. He did manage to get the Oakley Bomb Award for the fastest lap. Johnny Greaves took his turn on the familiar Bark River track–a track that he has owned in the past and was looking to makeup some ground on fellow Monster Energy/ Toyota driver Rick Huseman. Johnny started on the third row for the rolling start but emerged in first after taking the turn one hole shot. His Monster Energy/ MasterCraft Safety/ BFG clad Toyota was dialed in and basically checked-out. The Toyota of Rick Huseman would be the only pressure Johnny would feel the rest of the race. At the competition caution restart, Huseman saw this as his chance to get around Johnny. But Greaves was able to win the hole shot once again. He began to put some distance between Rick but knew that he could not make a mistake with Huseman on his heels. The Toyotas of Greaves and Huseman pulled away from the rest of the field and finished up one and two followed by Scott Douglas who finished a distant third. Johnny would also take home the Oakley Bomb Award for the fastest lap. CJ Greaves had his Monster Energy/ Traxxas/ BFG Super Buggy lined up for the land-rush start in the 9th position. He didn’t get a very good start, missing a shift and tangling with one of the other buggies as they sailed 5-wide into turn one. But he worked hard and pushed quickly into the top four behind Steve Krieman, Bob Klause, and John Frana, who was in the lead. CJ was in a tight race for third and made the move around Krieman in the gravel pit leading up to the mandatory caution. Not to be make the same mistake twice, CJ made a great inside move on the restart to pass Krieman in turn one to move into second. The inside position allowed him to hold the spot through turn two. CJ tried to make ground on John Frana who had pulled away for a sizable lead. Greaves ran out of time but kept his composure and held off pressure from Krieman to take the runner up spot on the podium. With the threat of rain in the Upper Peninsula, the pro races were moved up to early afternoon. 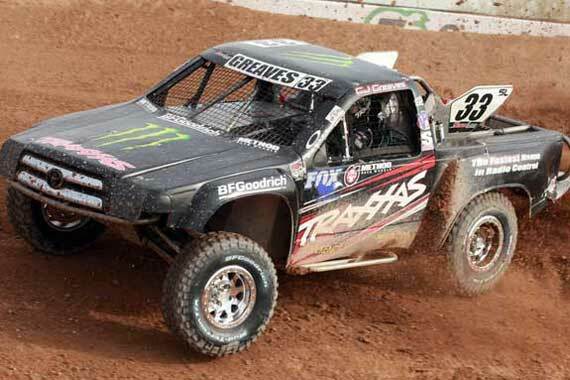 Jeremy McGrath would represent Greaves Motorsports first to the line in the Pro 2WD class. He started once again on the third row in the sixth position. The Pro 4×4 race featured a lot of carnage, taking some of the top drivers out of competition in the early going. Nobody had anything for Johnny Greaves. He passed Steve Barlow on lap two in one of his favorite places to pass, “Cemetery Corner”, and pulled away to a 10-car link lead. At the restart following the mid-race caution, it was a Monster move for the two Toyotas of Greaves and Huseman. Greaves won the hole shot and Rick Huseman, who had recovered from a lap one crash, made a couple of moves and took second at the AMSOIL turn. It looked like another Monster combo punch, but Huseman’s truck would succumb to the early damage and pull out of the race. Johnny had smooth sailing to the checkered flag to complete the weekend sweep, earn two Oakley Bomb Awards, and move to the top of the points standings. In the Super Buggy race, CJ Greaves wound up in the fourth spot as the field went through turns one and two but he quickly took third in the “Cemetery Corner” on lap one of Sunday’s final race. On lap three, he made a great inside move to take the lead in front of the crowd at the start/finish line. Greaves would hold the lead up to the caution at the halfway point. On the rolling start, he missed a gear in the horseshoe turn, loosing 4 positions. But Frena spun in front of him putting him in third and in position to battle back for the lead. With two laps to go, CJ had made his way to second. He tried one last charge to get around the buggy of Steve Krieman in AMSOIL corner but ran out of time and had to settle for the second spot on the podium. CJ maintained his points standings lead and stretched it to 33 points over the next competitor. 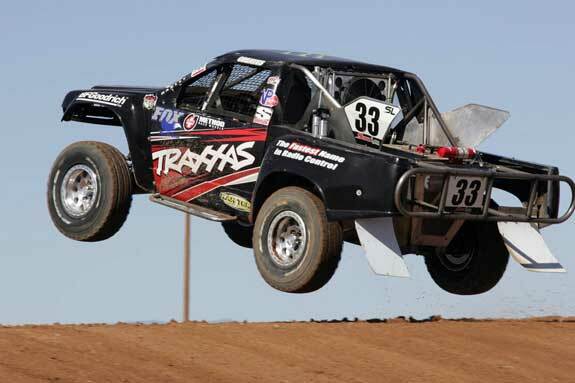 Greaves Motorsports will head to the Oshkosh Speedzone in Oshkosh, WI, on July 23-24 for the next rounds of the Traxxas TORC Series. Replays of live web streaming of the races can be seen on TORCseries.com. Abrams, WI (July 6, 2010)–CJ Greaves is beginning to make his presence known in off-road racing–leading the points standings in the Traxxas TORC Series Super Buggy class and walking away from rounds 7 and 8 of the Lucas series (LOORRS) in third place in the Super Lite class. He was the only Greaves to race at the Miller Motorsports Park in Tooele, UT, located just outside of Salt Lake City, in pursuit of the “arrive and drive” Super Lite title for Traxxas/ Monster Energy/ BFG/ FoxShox/ Oakley/ Simpson/ VP Racing Fuels in the LOORRS. The weekend’s Super Lite action began with the Grill ‘N’ Thrill—Dash-for-Cash Challenge Race, a ten lap shootout race Friday evening under the lights. Greaves started on the second row and was a little cautious in the early going but worked his way around the slower trucks and managed to have his number 33 Traxxas/ Monster Energy machine in the top five by the competition caution midway through the race. The lead truck of Jacob Person broke on the last lap allowing Jeremy Stenberg to move into the lead. CJ poured on the coals and made a final charge to the front to try to capture a podium spot which he managed to do, pulling the fastest lap time of the race in the process. CJ took the third podium spot for a great start to the weekend of racing. For the all important points races on Saturday and Sunday, CJ knew he had his work cut out for him having had some mechanical problems during qualifying. For Saturday’s race he started deep in the field on the on the fourth row. Friday night’s winner, Jeremy Stenberg, lead the first half of the race while CJ worked his way patiently into the top five by the competition caution. At the restart, the second place truck nearly spun-out causing the other trucks to check-up behind him. CJ took advantage of the situation and made an impressive inside move to shoot from fourth all the way to second. He began to size up the Stenberg truck but was able to take the lead without a fight when the number 88 pulled off the track with mechanical problems. CJ was able to take the illusive checkered flag for his first career Super Lite victory! The race on Sunday found CJ struggling with an extremely wet track, but he tried to be patient until the track dried. Friday night’s winner and Saturday’s runner up both went out of the race early. CJ had some troubles of his own: a spin after the caution and then narrowly escaping a crash when the number 9 truck of John Harrah flipped and rolled just in front of him, meant that he would have to make up a lot of ground. CJ worked his number 33 Traxxas/ Monster Energy truck into the top five, picking off positions one by one, eventually winning the third position. Greaves would run out of time though and had to settle for a hard fought third place to complete the podium spots. With a new season and a new feeling like they had their respective trucks dialed-in, Greaves and McGrath were ready to get the Pro class opener underway with sponsors onboard Monster Energy, Toyota, BFG Oakley, Fox Shox, Boatec, Method Wheels, VP Racing Fuels and new comers MasterCraft Safety and Liquid Force. Also, making his Crandon debut, 15 year old CJ Greaves—this time, instead of riding his bike and hanging out with his friends, behind the wheel as a professional race car driver. On Saturday’s opening round or racing, Johnny would complete the epic Father/Son victory sweep by winning the Pro 4X4 and CJ Greaves winning the Super Buggy class earlier in the day. Johnny started on the pole with Monster Energy/ Toyota/ BFG teammate Rick Huseman along side. Johnny took the hole-shot and checked-out, leaving the rest of the field to battle for the other podium spots. When the green flag flew following the competition caution, Johnny slammed the door on a hard charging Rick Huseman. Both Greaves and Huseman pulled away from the rest of the field with Johnny holding off several attempts by Huseman to get around him. Johnny fought off one more attempt by Huseman in the final turn (Calamity Corner) to take the first win of the season with Huseman a close second. Seven-time AMA Supercross Champion, Jeremy McGrath took on the Pro 2WD class which featured 9 competitors including several drivers moving up from the Pro Light class such as local guys Jeff Kincaid and Chad Hord. Jeremy qualified third on the starting grid and ended up taking the 3rd podium spot for Monster Energy/ Toyota/ MasterCraft/ BFG. Earlier in the day, Johnny’s son, Colton “CJ” Greaves, made his first race at Crandon in the Super Buggy class. Even though CJ has grown up going to Crandon, this was his first time to compete as a racer. And compete he did, sweeping the entire weekend and walking away with first place in the points and a 23 point lead over veteran Scott Schwalbe for Traxxas, Monster Energy, Toyota, and BFGoodrich. Sunday’s Pro 4X4 action was a little tougher for the Greaves team. Johnny got off to a good start, winding up in the 3rd spot behind Scott Douglas and Steve Barlow. At the restart, following the competition caution, Douglas missed a gear causing him to be rear-ended by Steve Barlow. As the racers bunched up and Barlow swung wide to get around Douglas, he slammed into Johnny, who was also taking the outside line around Douglas, pushing him into the wall breaking the sway bar. Johnny continued in the race but well off the pace finishing in 6th place. Jeremy also ran into some bad luck on Sunday. He was running hard and making his way to the front battling hard with Scott Taylor. Jeremy drove in hard in the heir pin turn on the back stretch taking the inside line in front of Taylor. But he swung wide and tried to hold the position, but Taylor got into the rear spinning the Tundra around, off the track and to the rear of the field. Jeremy worked hard to recuperate but time ran out and he managed a 6th place finish. For CJ, Sunday’s race was much more difficult than the one on Saturday. The track was very wet at the start of the race. CJ patiently took the high and dry lines during the first half of the race. As the track dried out, he was able to move into the racing groove and pushed his way to the front to complete the weekend Super Buggy sweep. 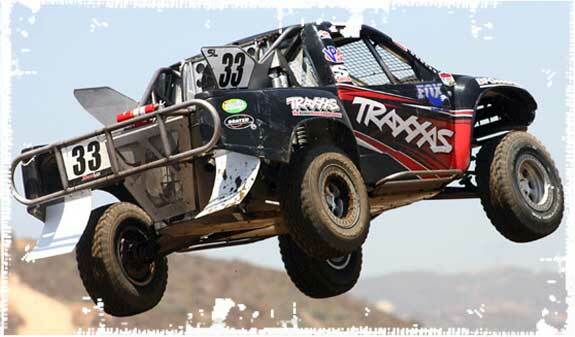 Greaves Motorsports and the Traxxas TORC Series head to Bark River, MI for rounds 3 and 4 on July 10-11th. June 14, 2010–Arriving at Antigo, WI was a little bit weird for Johnny Greaves. Going to an offroad race… but not racing. The TORC Sportsman Series kicked off its season at the memorable Langlade County Fairgrounds. This track is old stomping ground for Johnny, as Antigo was one of the Midwest’s original short-course tracks that he has had the pleasure of racing many times. This weekend however, was all about CJ Greaves and his Traxxas Pro Super Buggy. Friday brought lots of rain putting the track under water, and resulting in practice being canceled on Saturday morning. This gave much uncertainty for the game plan for CJ. Without getting a chance to test the track, and get an idea of where he compared on speed to the rest of the racers, left them wondering how aggressive he should be right away. After the draw for position, CJ lined up in 6th place. The decision was made to have a strong start, and try to maintain position while figuring out the track. As the race progressed CJ was making up a lot of time on the leaders, and realized he indeed WAS a competitor. With a great charge to the front and smooth coaching by Johnny, CJ made his way behind the leader, but as the white flag came out, CJ ran out of time, and had to settle for second. However, his driving skills were not left unnoticed as he received the first HARD CHARGER award of the year and $150.00 in hard cash! More rain came Saturday night leaving a repeat of the day before, with practice being canceled. The invert put CJ starting in 10th place, but he was not discouraged. After the previous days battle, he knew he had something for veteran Scott Schwabe and couldn’t wait to get a second chance. By the mandatory caution CJ had worked his way up to 2nd place behind Scott. All in all, the weekend was an awesome opportunity for CJ to get ready and build the confidence needed to race against these drivers in the upcoming weekend at the prestigious World Crandon Brush Runs, June 19-20th. Thanks again to all his sponsors for putting him out on the track, and to his team for working all day Friday to get his Super Buggy ready for its inaugural race. May 25, 2010–Have you heard the saying: “If I didn’t have bad luck, I would have no luck at all?” Well, Johnny is beginning to believe it. The Monster Energy Toyota team of Johnny Greaves has had its share of bad luck already this year, but they do not give up! At a couple days notice, they set out again to the LOORS race at the Las Vegas Motor Speedway, hoping to bring home some podium finishes before the TORC season gets underway in just a short few weeks. Friday’s qualifying put Johnny and Rick Huseman on the pole. It was looking like it was going to be a 1-2 Monster Toyota blow out, Rick getting out front on the start with Johnny on his rear bumper. This tight battle remained for 4-5 laps. Johnny was working every line trying to make the pass, however, coming into turn 2 he tried an aggressive move and bicycled on two-wheels into the K-rail. His BFGoodrich tires kept him in tact and he was able to get back on the track only losing two positions. The K-rail however cut a brake line, and Johnny was left to race with no brakes. Remarkably, he retains his position for the rest of the race, giving him a 4th place, just short of the podium. Sunday’s race put Greaves and Barlow on the pole. Frustrations have set in, and Johnny really is looking forward to being back in the winners’ circle. The plan was to get out front right away and stay out of trouble. The green flagged dropped and Johnny got a clean jump right into the lead. The Tundra ran hard and flawlessly, as he began to make a gap on the rest of the pack. At the caution, it looked as if finally the Greaves team was going to be back on the podium. Unfortunately, after the restart within a lap Johnny could feel something was wrong, and soon thereafter the rear axle failed. Johnny had no choice but to pull off, and again relinquish his win. Talking to Johnny after the race he quoted: “I’m really disappointed. I’m waiting for everything to go right for once, but I’m confident my team is determined to have things right for TORC, so we’ll test again before Crandon, and make sure were ready!” Thanks to all the sponsors, especially FOX Shox that helped Johnny and his team get to another LOORS event, when the budget didn’t allow it. CJ Greaves Nicknamed ‘Whitey’ after Giving-up Win on the Last Lap! CJ had the perfect opportunity on Saturday to reclaim the win he’s been awaiting. Leaving Surprise, AZ with losing both wins on the white flag lap, he has had a lot of time to think about what he would do differently. Qualifying left him on the pole, so he was anticipating a clean start. He got pushed to the outside, but still maintained second behind the leader. They battled for the first half of the race, with CJ waiting for his opportunity. Still in second as the caution came out, Johnny coached him on the radio. Just after the restart, CJ made a sweet inside pass on the leader and captured first place. With the white flag out, and two corners to go, CJ makes a wide turn, leaving room for second place to try a pass, resulting in the two trucks tangling and CJ spinning out. The truck wouldn’t restart and CJ sat for quite awhile before he finally made his way across the finish line. CJ “Whitey” Greaves seems to be cursed by the white flag. Sunday’s race didn’t prove to be any better for CJ. This time the invert wasn’t so kind to him. Starting in the third row, he knew if he was to make it to the front, he would have to move up quickly. The start left him in 6th, but by the second lap he had already worked his way up to third place. Battling with second CJ got a little sideways and inadvertently went off the side of the track. From that point there was a lot of passing and carnage going on. CJ began his push to the front, but only to be set back again. Going into turn-2 alongside Ward, they touched, and the contact sent CJ on his top. Track workers tried to get him turned over, but by the time they did the truck was left with no oil pressure, and CJ had to be towed off. CJ wasn’t too discouraged, he loves driving the SuperLite, and isn’t afraid to tell you he’s still learning, he was just a little too impatient this time, and still very hungry for a win! Greaves/McGrath Looking Solid in Prep For Upcoming TORC Series! The team of Johnny Greaves and Jeremy McGrath decided to get in one more test race in preparation for the TORC Series opener in Crandon, WI. So what better way than to put the team to the test, and go race rounds 3 and 4 of the Lucas Oil Off Road Series. Last month, the LOORS Las Vegas opener showed that this Monster MasterCraft Toyota team is a force to be reckoned with, although displaying some bad luck that weekend, they came to Surprise, AZ with the same crazy fast speed and their game faces on! After putting in the fastest U4 practice times, Greaves found himself starting in the third row with the inversion. With help of his BFGoodrich tires, and Toyota motor, Johnny displayed his usual “Greaves style” as he maneuvered himself around the outside of the pack in turn one, and completed another smooth pass in turn two, finding himself already looking at the back of the leader. On the 2nd lap, Johnny made a quick switchback pass, for the lead. Hungry for a win, he continued to charge hard, as he laid the next 4 fastest laps, and had a 12second lead by the mandatory yellow, only to find out what he had suspected was true, he had a rear tire going low. The decision was made not to pit, and Johnny continued to lead for 2 more laps, until the tire finally blew forcing him to the pits for a quick change. McGrath losing no speed from the previous rounds 1 and 2, proved once again to be one of the fastest on the track. Qualifying second, put him on the pole, along side Carl Renezeder. The two drivers put on an awesome display of “cat-n-mouse” right to the finish, with Jeremy putting on several charges to get pass Carl, but unfortunately couldn’t make any of them stick. Jeremy and his new Monster MasterCraft Toyota U2 are showing incredible speed, and have definitely got the attention of all the other drivers, including Rob MacCachren, multiple champion, who fought to get past him, but to no avail! Optimism was high in the pits for Sunday’s race! The team felt confident the Toyota Tundra’s were going to be strong, both Jeremy and Johnny qualified 2nd, however, the inversion put them both starting in the third row. U-4 was all but exciting, and kind of short lived for Johnny. He had worked his way up to 3rd position, behind Carl Renezeder, and was waiting for the door to open to make a clean pass. Rick Huseman, running 4th, was trying to work Johnny at the same time. Contact was made as Rick tried to get on the inside of Johnny. As the front wheel was turned and in motion, this contact caused the seal to get knocked out of the power steering, which eventually lost all steering fluid. Johnny after a few laps was forced to pull over. U-2 on the other hand, was full of excitement, almost too much to recap in a race report. There were multiple accidents and a lot of carnage throughout the entire race. Jeremy got turned around backwards on the face of a jump, from some rear contact, already on turn 3. Starting from 18th, Jeremy and his Monster Energy Toyota made some serious headway, working his way all the way up to 5th position, closely behind the lead pack. Things were looking good, with plenty time to still make it to a podium finish. Finding an opportunity, Jeremy tried to make a pass for 4th place, only to get a severe hit in the rear from another competitor, spinning him completely around, and then driving completely up over the front end of the MasterCraft Toyota, and putting it out of commission for the day. Lastly, we all knew the day would come, where Johnny’s son would take the field. CJ Greaves, at the young age of 15, ran his Traxxas SuperBuggy at the LOORS Las Vegas opener only to run in the lead the entire race until the last lap, his very first time in short-course. At that time we knew we had a racer here! CJ brought his same upbeat, fun, and of course a very fast truck to the track here in Surprise-this time in a SuperLite. Given a great opportunity by Speed Technologies, CJ was out to show the fans what these small trucks are made of. Saturday CJ started in pole position. He let a few guys get him in the first few corners after the start, but not for long. As a small battle happened in front of him, CJ took advantage of the moment and passed the pack for the lead. For the next 5 laps CJ held off the pack, and made it look like he was going to take his first race in checkered style! Two corners before the checkered flag, CJ went in tight to protect his line, and hit an unexpected rut, flipping him over, and giving over the lead. He crossed the finish in 7th position. At the end of the weekend, the team felt that they are ready for the TORC Series to begin. The trucks are very competitive and the drivers are stoked for the battle in the Midwest! 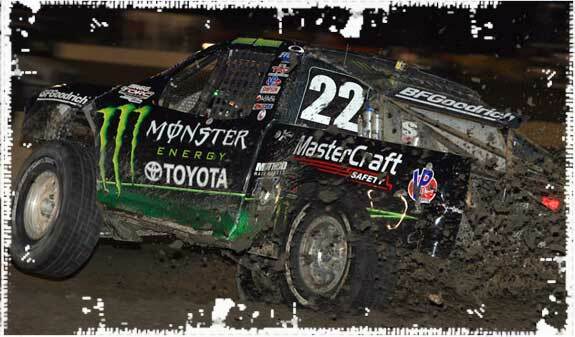 Monster Energy Toyota BFGoodrich Team of Greaves-McGrath Storm into Las Vegas at a Minutes Notice! On Tuesday, March 2, 2010, Johnny Greaves received the phone call giving the okay to load up and attend the first race of the year put on by the Lucas Oil Off Road Series. With very little time to prepare, Johnny’s team, still back in Wisconsin, working heavily on the McGrath Unlimited 2 (U2), was told to load up, and make their way to Las Vegas Motor Speedway. Meanwhile the Unlimited 4 (U4) was at Johnny’s shop in California because of a recent tire test for BFGoodrich. Neverless, the team pulled it together and arrived at Las Vegas on Thursday in time to prepare for the weekend. Friday’s practice proved the Greaves-McGrath team was ready to take on the Lucas Oil Champions by capturing both fastest lap times in the U4, and U2. During qualifying however, Johnny had a shock that got damaged, so he had to pull off during Lap 4, but still salvaged 4th fastest time, and McGrath continued to top the field with the fastest lap time in U2! It was looking very promising for the Monster Energy Greaves-McGrath team. In the U4 they inverted two rows putting Johnny on the pole, along side Scott Douglas. The two portrayed an epic battle to the end with Johnny trying every move in the book to get around Douglas, but with Douglas being able to get all the good lines, it was very difficult to make a pass. With only 3 laps left, the BFGoodrich tires were working great and providing a good run at Douglas in a couple cases, and had appeared Johnny was going to make the pass. However, two laps from the finish the Toyota’s drive shaft broke leaving him parked, giving a disappointed Johnny a 12th place out of 17 trucks. When it came time for the U2 race, McGrath came to the line totally stoked after having dominated the lap times since arriving in Las Vegas. The invert put Jeremy second row outside. After a 4th place start, Jeremy began his charge to the front, but was just a little too eager for his first U2 win. In his excitement he created some early contact, which resulted in a broken tie rod, taking McGrath out early in the race, finishing 25th. After downpours Saturday evening, Lucas Oil officials decided to cancel qualifying Sunday morning, and save the track for race time. This put the Greaves-McGrath team starting in the back of the pack since their start position was based on their previous days finish. Johnny went to the line not worried, he was confident that his Toyota motor, and BFGoodrich tires would give him a terrific jump on the rest of the pack. Lap two gave Johnny a surprise though, as he watched his air cleaner get snapped off, and the gasket get sucked into the carb, leaving his Toyota very hard to control. With Johnny’s experience, and ability to drive in almost any situation, he completed the race, and still salvaged a 5th place! McGrath also in the back of the pack, went to the line with an entirely different attitude this time. Having an extremely competitive 25 trucks in front of him he patiently picked his lines, and made his way thru the pack. Still very hungry for a win, he ran the fastest lap of the race, and finished with an amazing 4th place, passing 21 trucks along the way. With the first race in the books, the team is extremely excited about both trucks being at the the top of their class. The Greaves-McGrath crew is now headed back to WI, to regroup, and make sure the trucks are 100% ready for the 2010 season to come.